Ah, the last month of relaxation - just doodling on the plot plan, figuring out how many seed pots to plant. The Gardenate suggestions are posted above but I just ignore them for January. I won't be starting any seeds until Feb, so I will grab husband and go to the coast for a few days before the seeding starts. We cancelled our Sept-Oct vacation because of Sweetie so it will be nice to get away. Maybe Santa Barbara? Or, maybe Palm Springs in the desert? Good news for CA is that we should get some nice rain this week, on into next week, plus snow in the mountains. Enjoy your vacation, Sanderson. I'm going to start seeds in the next few days. Gotta decide what and how many, first. Ah...a new year, and a new batch of seeds to start! I have to rummage around the shop and find my heating mat and grow lights. They've been shuffled around to get at all the holiday decorations- so who knows where they are! Seems like an Easter egg hunt every January. I should never be surprised where they've been placed since last Spring. Also have to sterilize some planting trays and a batch of planting mix so I'll be busy inside while the weather outside is getting wetter as I write. sanderson ... that will be a well deserved vacation. Enjoy! Yes! Have fun! You deserve it, sanderson! Hmmm, yardslave, I am re-using my 72 cell starter box. Should I do something special to sanitize it? I had no problems last year. But that was out of the box. I use commercial starter mix for the cells. I wash all last year's gunk off my starting cells with soap and water and rinse them off, then dowse them in a bucket of water with 1/4 cup of bleach and give them a few minutes soaking. Rinse them off again, and they are ready for some soil. The reason for the bleach and water is to prevent any fungus or bacteria that may have hitched a ride on last years dirt that remained from last year's seed starting- like damping off or verticillium wilt. I'm southern cali and idling away with basically defunct beds. Can't get anything started. Going to have to get a heating mat and set up to start seedlings indoors and transplant. I always have horrible results with that. Still we're in the rain zone so I'm happy. NorCal is supposed to be pounded this weekend. Don't wash away. @No_Such_Reality wrote: Still we're in the rain zone so I'm happy. NorCal is supposed to be pounded this weekend. Don't wash away. We're building our ark right now. The dams are open in this area to release water, to make room for this rain. Any threat to you from the burn areas? Mud slides, run-off? Highway 1 south of Carmel has had multiple rockslides blocking the roadways, but road crews are keeping up- so far. The weather predictions say Saturday and Sunday should be the toughest with more slides and uprooted trees as the ground gets saturated. The weather hasn't cleared enough to assess the impact on the burned areas, but the last time a fire ravaged the area, mud and silt filled one of two reservoirs that we use for drinking water. The two reservoirs to the South are filling slowly, so I would imagine the vegetation is holding the soil back. I took a perverse pleasure in planting seeds in the house, while outside it was wet, cold, snowy, and dark. *Sanderson, did yours do any good from last fall? Mine were looking good until snowed on, but still nothing but leaves. CN, Just a hint of broccoli heads but the next two months will tell. Meanwhile, did you see the purple cauliflower I posted? I'm in love! @sanderson wrote: Meanwhile, did you see the purple cauliflower I posted? I'm in love! I'm in love, too. I already added it to my seed list. @countrynaturals wrote: I took a perverse pleasure in planting seeds in the house, while outside it was wet, cold, snowy, and dark. Yesterday was beautiful -- sunny and mid 60s. I transplanted the sugar snap peas from the Jiffy Pellets into the "Salad Bar." Also, Katie gave me some old seed packets from 2011. There was an unopened packet of sugar snap peas in that bunch. I dumped the whole packet in front of the other peas just to see if any of them will sprout. Time will tell. Your timing is too perfect... *singsong:* Peas didn't rot, Peas didn't mold, Pea seedlings in a plot, 9 days old. @BeetlesPerSqFt wrote: Your timing is too perfect... *singsong:* Peas didn't rot, Peas didn't mold, Pea seedlings in a plot, 9 days old. I finally started on my summer garden. Now have 2 SP, each cut in half. I planted icicle radishes in a container in the "Salad Bar." There are no freezing temps in the 10-day forecast, so fingers crossed we won't have any more of that this year. Yesterday I planted ground cherry seeds in the house. Today I'm going plant lemon balm, bee balm, purple sage, and amaranth seeds inside. We're in for another week of rain, so I won't plant any more in the sfg for a couple of weeks. My icicle radishes never sprouted, so I think they rotted in all the wetness we had last week. I'm still holding off starting seedlings until Valentine's Day. I did however print a new plot plan to start penciling proposed plants. 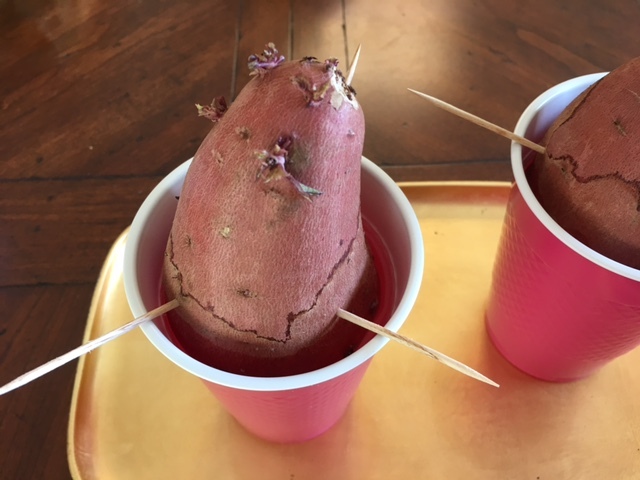 And, the sweet potatoes slips are about 1" high. 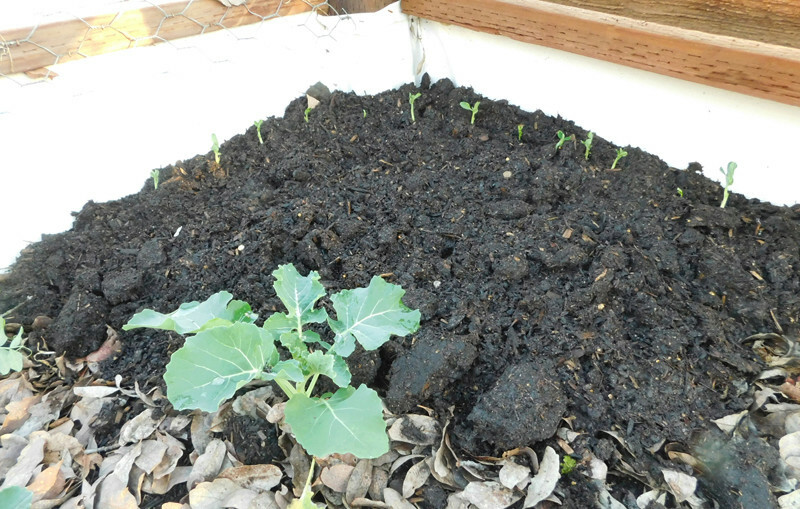 @countrynaturals wrote: My icicle radishes never sprouted, so I think they rotted in all the wetness we had last week. 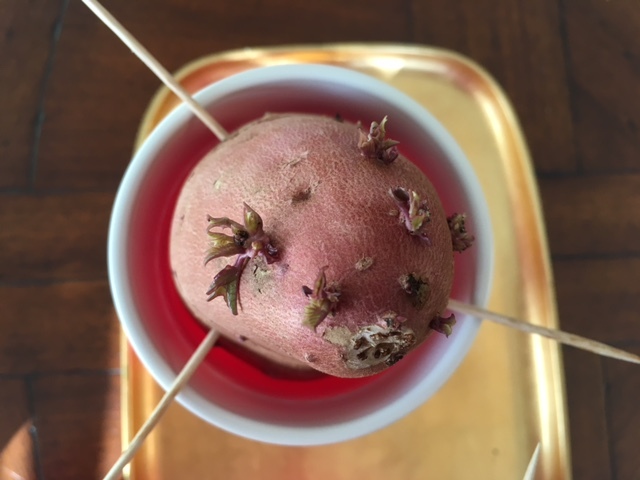 The planting charts in my ANSFG book (mine is edition 1) say that radishes take 29 days to germinate at 41*F and 11 days at 50*F. If more of the hours of the day during the last week and a half have been below 50*F than above, they made need some more time. Thanks, Beetles. Our days have definitely been in the high 40s to low 50s, so I will leave them alone for another couple of weeks. We're in for some more serious rain, so I won't be out there much anyway.